Fall 2011 – NSU Middle Lab and Natchitoches Magnet School students continue instruction at NSU Williamson Hall. - Mailed 500 letters and brochures, one to each student’s home. - Provided formal presentation with young engineers at 8th grade high school planning programs, Spring 2011. Result of recruitment: NCHS increased IED from 2 sections in 10/11 (up to 40 students) to 3 sections in 11/12 (up to 60 students). 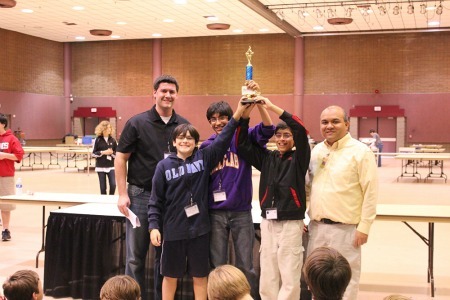 February 9, 2013--NSU Middle Lab school placed 3rd in Regional competition! Read the press release here! science, technology, engineering and mathematics careers. Provided $300 technology grants to each participating school and $200 to the highest scoring team from Natchitoches Parish (St. Mary’s School) at the LSUA regional competition in Spring, 2011. Partnered with La. School for Math, Science and the Arts to host first annual Math Explorers Camp targeted for middle school students. –Camp included business tours at City Bank and Trust Company, Bank of Montgomery, Weyerhaeuser timberlands, Roy O. Martin Chopin plywood manufacturing facility, Wal-Mart and Weeks Tractor Supply. additional $200 (St. Mary’s School). presentation of the team training and taped media interviews. –19 student campers from grades 4 – 12. NCPTT will conduct robotics sessions throughout 11/12 school year and be an official designated robotics team coordinators for the Cyber Innovation Center robotics competitions for grades 4 – 12.